My friend took this photo today at the Cancun airport. I just love it. Shared vs. Private Airport Transfers: Which option is right for you? If you are traveling to Cancun or the Mayan Riviera, you’ll need to get yourself from the Cancun International Airport to your Resort, Hotel, villa, or rental casa. There are several modes of transportation to choose from and I’ll outline the pros and cons of each one here. Transportation included in your vacation package. Check with your Travel Agent or, if you booked it yourself, check your travel documents. Many vacation packages are sold with shared transportation to the hotel included. This is handy, but be prepared for possibly longer wait times at the airport. Also, you’ll have no say-so in the pickup time at the resort so you may end up at the airport 3+ hours before flight time. Buses. The bus company is called ADO. Plan on extended wait times for the bus to arrive and then to fill to maximum capacity. This option is better suited for more seasoned travelers. The bus will take you to the Downtown Bus depot. From there, you’ll need a taxi to your hotel. The Bus costs about $4 to the depot, then a taxi will cost you about $10 to the Cancun Hotel Zone for $3 to Downtown Cancun hotels. This is a great option if you are staying in a downtown Cancun hotel. Shared Transportation. This is a great option if you are traveling by yourself or if you are looking to save some money. The vehicles are 10 passenger vans with luggage space. Rates are per person in US Dollars. Keep in mind the total cost for your airport transfers and make sure to compare the total cost for shared vs. private transportation, especially if you have more than 2 people in your group. Taxis at the Cancun Airport. There are taxis at the Cancun Airport available for you, but this is our least recommended transportation. First, the cost is usually the same for ONE WAY as private transfer is for ROUND TRIP. Plan on spending $60 USD for one way to Cancun hotels. Second, these drivers are not as secure and trustworthy as private drivers. For instance, you forget your cell phone, purse, backpack or other item in the taxi (happens ALL THE TIME), well, you are just out of luck. Renting a car. This can be handy if you are staying in the Riviera Maya and you are a good driver. Be prepared for extremely aggressive driving in Cancun. This is not an option I recommend at all. Traffic is a mess, police purposely pull over rental cars for bribes, parking (especially in Cancun and Playa del Carmen) is a real bugger, and if you are in an accident the process here is MUCH DIFFERENT than back home and will surely eat up a lot of your vacation time. If you do decide to rent a car, be sure to get the full-coverage insurance. There are many car rental agencies at the airport. It’s best to book online in advance and go with an internationally known company. You can read more about car rentals here. Private Airport Transfers. I have saved the best for last. Of course, this is the transportation that I recommend not just because it’s what I do, but also because it is the best and I firmly believe that. 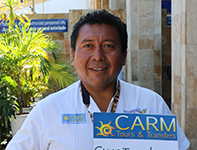 CARM Tours & Transfers offers safe and reliable transportation from the airport to all hotels, villas, and rental properties in Cancun and the Riviera Maya. Our door-to-door service is fast and hassle-free. I love selling a service I can stand behind 100%. Not sure which location your hotel is in? Just start typing in your hotel name here, click the hotel name and it will take you to the right location to book your airport transfers. CARM Tours & Transfers also offers transportation to areas further out. We can take you to Merida, Chichen Itza or Valladolid, Chiquila ferry dock (the ferry that takes you to Isla Holbox), Mahahual or Bacalar, Sian Ka’an Biosphere or Punta Allen. We will track your flight and we’ll be waiting outside the airport terminal with your name on the sign. Here I am after arriving to terminal 2 from JFK last year. You can watch the video of getting through the Cancun Airport, however I have to apologize for the screaming child in the background. Life Happens ♥. If you have any questions about which option is right for you, just give me a call, shoot me an email or hop on live chat. I’m happy to answer all of your questions. Here at CARM Tours & Transfers, we offer a pet-friendly transportation service. It is recommended that you keep your pet in it’s carrier or crate while in the vehicle for everyone’s safety. We can handle any size or number of pets in our private transportation vehicles. 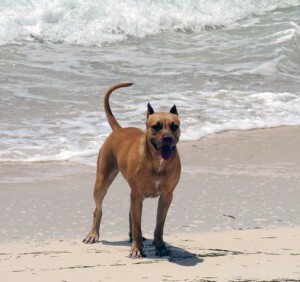 Book your Cancun Airport Transfers with pets here. If the pet is older than 3 months of age, it requires a Health Certificate and Vaccination card, specifying the application of rabies vaccine with a validity no longer than 1 year. These documents must be presented in original and copy. 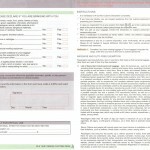 It is very important to assure that the documents match with your pet data (age, breed, color, sec., etc.) and in this way avoid problems in the procedure of entering Mexico. The HEALTH CERTIFICATE must be showed in headed paper with the printed Professional License or Photocopy of the medical Veterinary License who issues the certificate. WITH THE DATE no older than 5 DAYS, including the health status of the pet and that it HAS BEEN TREATED AGAINST ENDOPARASITES and ECTOPARASITES within 6 months prior to your trip and that it is free from any internal and external parasite. Your pet will be physically reviewed by Official Personnal from Agriculture and Livestock Production Health from SAGARPA, and if coming from a country with presence of foot and mouth disease or from zones in risk, a prophylactic treatment will be given to your pet, free of charge. The import of one or two pets is free. 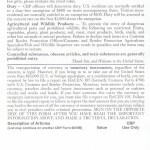 No animal bedding or similar products is allowed. Now, we had had my dog’s health and vaccination records with us which stated that the vet had supplied external parasite medication. The Health certificate, however, did not specifically state that she was “free from parasites”. And, the inspector wanted not only that on the certificate, but also the specific medication given – eg, Frontline. It was a real hangup and we spent an hour in customs before we were able to move on, with a finger wagging from them and a warning for ‘next time’. In the Lobby: Make sure to ask if pets are allowed in the lobby as even some pet-friendly hotels still do now allow them to be in the lobby. In the Room: Never leave your dog alone in the hotel room. The #1 reason that a hotel chooses to not allow dogs is because people leave them alone in the room. Even well-trained dogs can cause damage inside the room or they bark or scare the housekeepers. Use the Do Not Disturb sign on the door and use the deadbolt to guard against frightening the housekeeping staff. Take your dog as far away as possible from the hotel and landscaped areas around the hotel. Some hotels even have a designated pet walk area. Book your Cancun Airport Transfers with pets here. 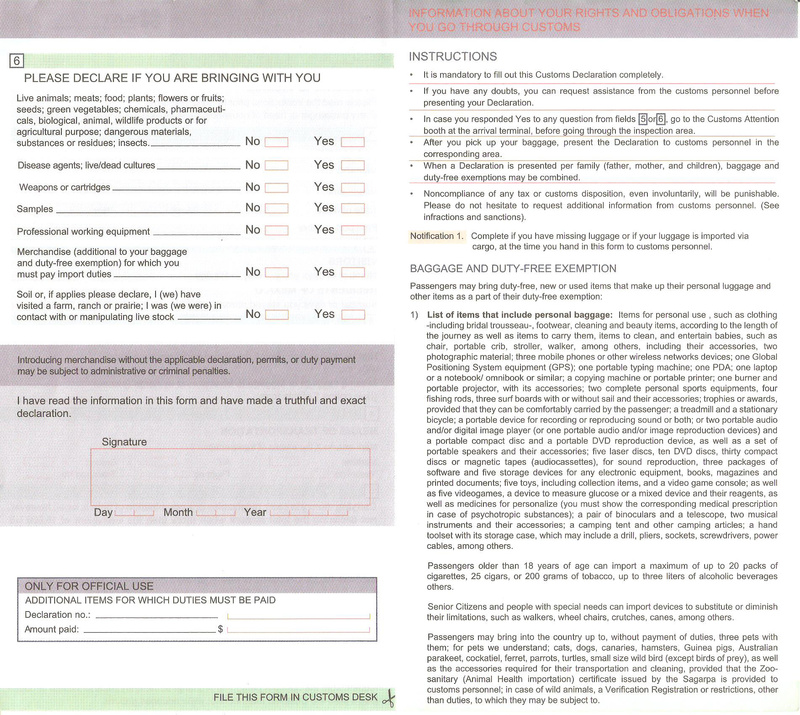 When you leave the US or Canada for your vacation in Mexico, be prepared to fill out Customs and Immigration forms. It is helpful to know what these forms look like and what questions you will be asked. The first two scans are your FMM, or Tourist Visa. 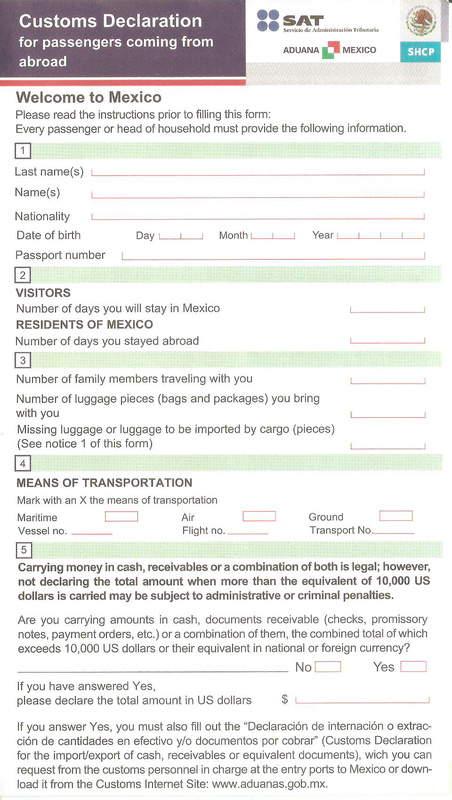 You will be given this form to fill out while on the plane before you arrive to Mexico. 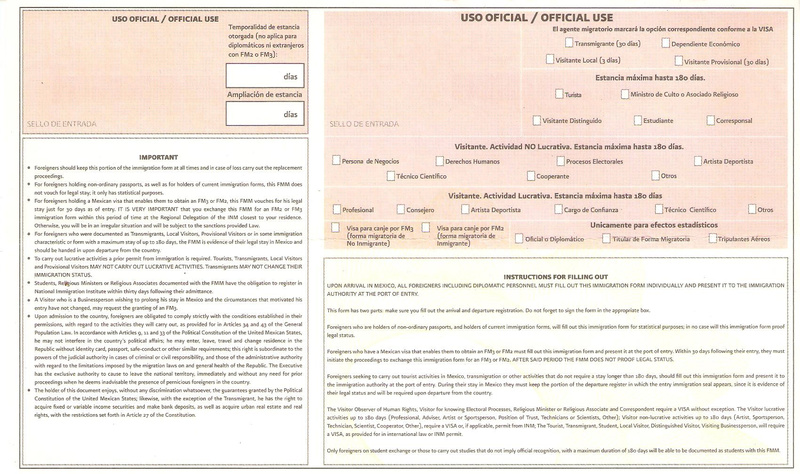 This is a simple form that just requires the info directly off your passport. When you arrive to Cancun International Airport, the first stop after getting off the plane will be at Immigration. Here the immigration officer will take the FMM form you filled out, keep the blue side and give you back the green side. 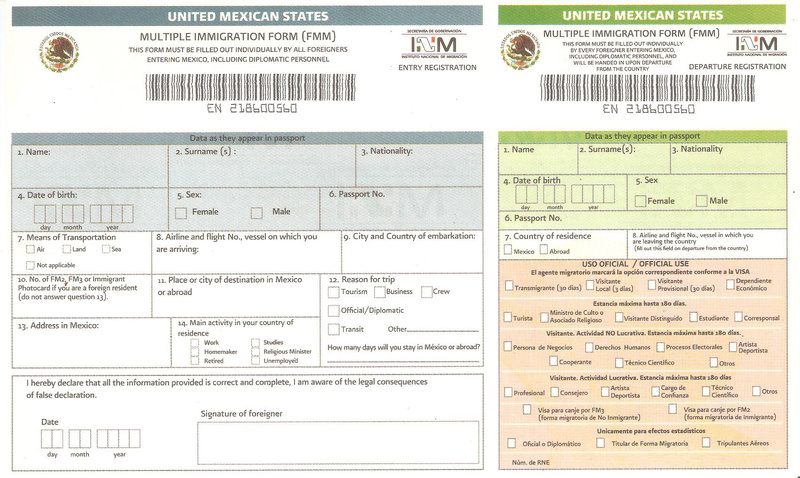 The blue side is your Entry into Mexico and the green side is your departure visa when you leave Mexico. It is VERY IMPORTANT to keep the green part (with your passport) as you MUST have this to leave Mexico. 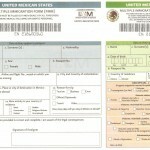 What happens if you lose your FMM Tourist Visa while in Mexico. Every person must fill this out. 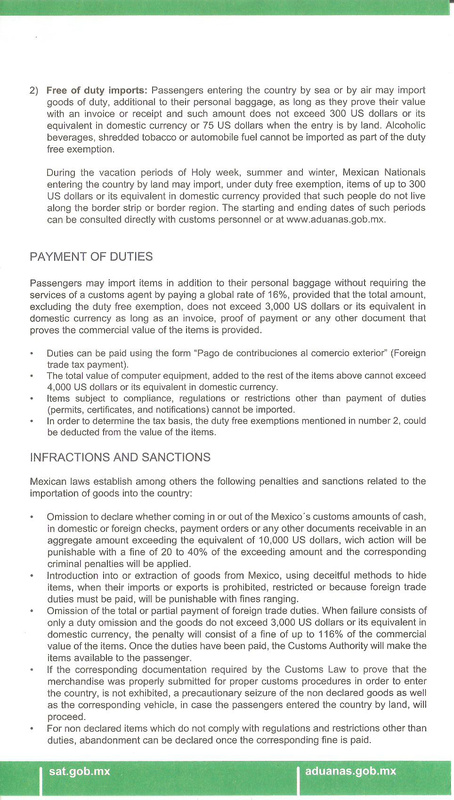 Also during your flight to Mexico you will be given a Customs Declaration form. Each head of household needs to fill this out. Again it asks for your basic passport info, how long you will be in Mexico, and how much luggage you have. 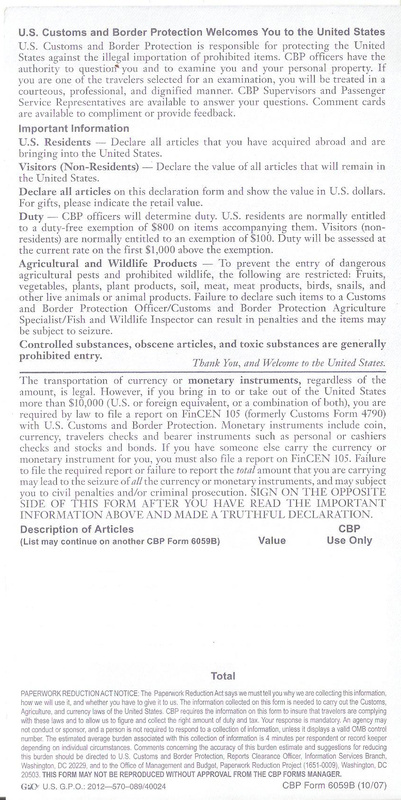 Most importantly it asks if you are carrying 10,000 US Dollars or more, any meat, food, plants, chemicals, weapons, or merchandise for which you need to pay duty. After you land and clear immigration, your next stop will be to pickup your luggage and go to customs. Your luggage will go through x-ray and you will hand the customs agent the form. There is a button that each person must push. If the button light turns green then you proceed to pickup your scanned luggage. If the button light turns red, your luggage will be searched. 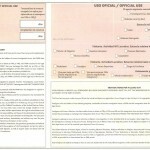 When you leave Mexico you will surrender your FMM Tourist Visa and you will fill out the US Customs Declaration form. The US wants to know about your travel, where you’ve been and where you are going. 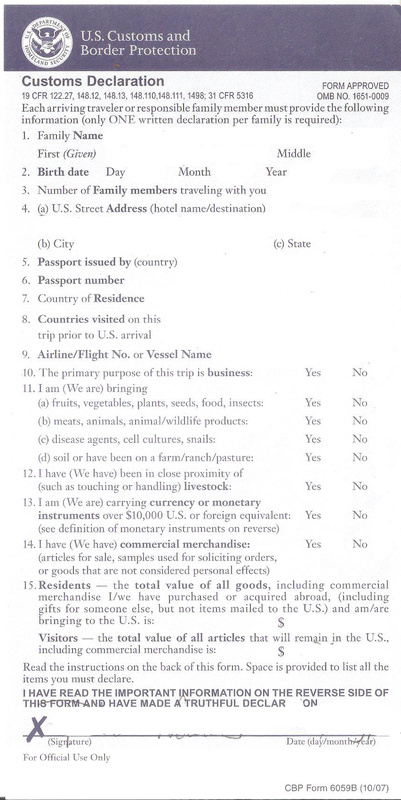 The form asks again if you are bringing cash, meat, plants, merchandise, etc. 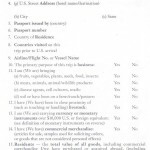 You will give this form to the Customs agent when you land in the US. 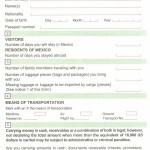 For more information about traveling to Mexico and the paperwork you need to fill out, please visit http://www.tsa.gov/traveler-information. 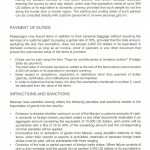 Lost Tourist Visa Card – What happens if you lose your tourist visa while in Mexico? 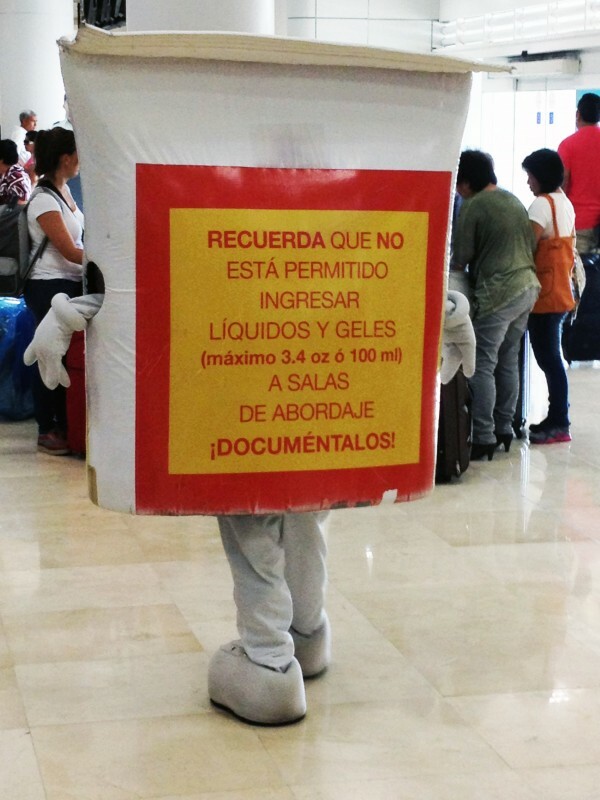 When you leave Cancun Airport to head home after your vacation in Mexico, you may want to take a few things back with you. Almost everyone has a list of friends, co-workers, nieces and nephews for which to buy souvenirs. There are some good markets in Cancun, like Market 28, however it is handy to grab these items on your way out of Cancun at the Duty-Free shops at the Cancun Airport. 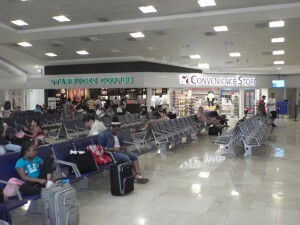 The shops are located in all the departure terminals. It is not possible to access these stores upon arrival. Duty-Free Shops are accessible on departures only. Some of the most popular shops are Sr. Frogs, Sunglass Island, Hard Rock Cafe, Oprendi & Ocean Blue. You can buy liquor, cigarettes, t-shirts, and souvenirs of all kinds. There are also food court areas at both terminals, including a Bubba Gump Shrimp Co., California Pizza Kitchen, Johnny Rockets, Starbucks (of course), Margaritaville, Domino’s Pizza, Peking Xpress, Guacamole Grill (fast food), Burger King, Baskin Robbins, TGI Friday’s, drug store and convenience store. When I arrived to Cancun Airport I took this video so you can see exactly what it looks like. I could only start filming after customs and immigration. The video starts right after customs. Please excuse the loud background noise. For a more complete list of the Airlines arriving and departing from the Cancun Airport including contact info, check out CARM Airline Directory. Here I am with my best friend TJ after we exited the airport and found our sign. Our driver, Augustine, was waiting for us. Then it was a swift and safe ride to Cancun! 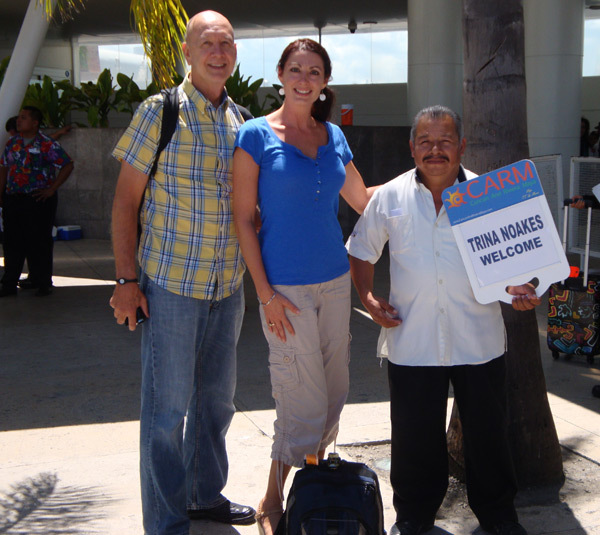 You can book the same private airport transfer service to any resort in Cancun or the Riviera Maya here.